Being a highly challenging sport, it goes without saying that surfing requires a fitness level that can sustain the physical demands at hand, both energetically and mechanically. For those of us who cannot be in the water every single day to maintain that kind of conditioning and the related technical assets, training the body in a surf-specific manner must be attended religiously in order to be better able to pick up where we left of… or even further ahead. 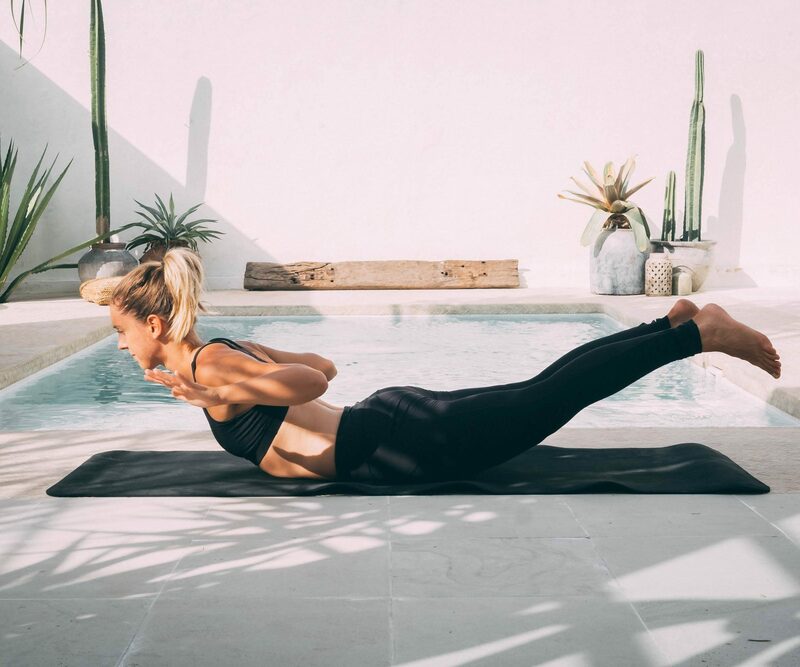 Whether it is to prepare for your next surfing trip or to foster basic body strength in between, here are 6 exercises that you can do with minimal equipment to target strategically the main muscle groups involved in surfing. Although X% of the time in surfing is spent standing up, working on the stability and strength at the hips is an essential in your preparation as it also targets your core muscles and makes you strong on your feet. Take a comfortable step so that your knees make a 90° angle when bent. As you lower the backward knee close to the floor, keep the body straight and tall, shoulders back. Most of the body weight should be directed towards the back of the front foot to protect the knee. On your way up, bring the feet together again whilst keeping low. This drill is meant to train the quick motion of coming up on your board and therefore, is designed to keep your fast twitch fibers sharp and your hip flexors strong. It also requires a good amount of powerful core activation. Kneel on a soft surface (like a yoga mat or thicker), knees and feet a little wider than hip width. Start by shifting your weight backwards and as you press the floor with your toes, slightly lying back, extend your body upwards at the same time as tucking the knees up to your chest. Then, land on your feet in a squatting position. Make sure to get a good absorbtion of the landing by making as little sound as possible. To keep your paddling muscles fit and endurant, this exercise is well designated to target the back of the shoulders and the grand dorsals. The use of the elastic band is particularly interesting because of its gradual resistance quality, which is the same kind of resistance you get in the water. Execute it one arm at a time for actionable results. Bending forward slightly, knees unlocked, keep the chest out and shoulders back to ensure a straight trunk. Hold the elastic band in front of you, arms above your head. Pull one arm backward while keeping the shoulder engaged and opening the chest and then, alternate to the other arm. Acknowledging the width of your board as well as the fact that your hands must be positioned just under your shoulders in preparation for getting up, a tricep pushup is just the right proportion of pectoral, shoulder and triceps work for a surf-specific purpose. Hold a high plank position on your hands and feet. The head, shoulders and hips must form a straight line in regard to one another. Bringing the chest down first, start bending the elbows by keeping them close to your body, at about a 15° or less angle at the shoulder. Then, pressing in your hands and tightening the core, go back to your initial position. Wanna have a good relationship with your board and facilitate any movement you need to perform? Strengthen your back from the neck to the thighs by training the simultaneous activation of the whole chain of muscles involved. To keep it real, perform the version in which the elbows are bent and hands close to you. Lying on your stomach, start with the elbows bent, toes pointing longitudinally and chin in, looking down on the floor. Then, simultaneously lift the chest and both legs up from the floor as high as you can. Bring the shoulder blades together and sqeeze the gluts for 3 seconds, then release back down. Finally, with all the turns and twists involved while manoeuvering on a wave, the oblique muscles must not be forgotten in our fitness prep and maintenance. They are needed at both ends, that is when rotating the hips to direct the board as well as the thoracic cage to move the shoulders. Hold a plank position on your side with the elbow right under the shoulder and the weight supported on the feet slightly appart. Open the arm up, then twist inward to pass it across the body as far as possible. The hips must remain elevated. Repeat on the other side. We’ve had a lot of people ask about how to prepare for our surf trips, so we hope this sequence makes you feel ready for the waves!